Strangles is highly infectious. It is spread via direct nose or mouth contact, and / or indirect through contaminated drinking buckets, tack, rugs, feed, pasture, wall, floors or people (boots, clothing, hands etc.). 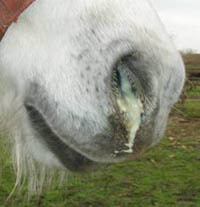 Asymptomatic horses are often responsible for initiation of disease outbreaks. Illness due to stranlges infection requires prompt veterinary treatment (antibiotics therapy, supportive care, anti-inflammatory medication etc). This is to control the infection, alleviate symptoms and prevent secondary complications. Vaccination: Unvaccinated horses require 3 vaccinations two weeks apart. Vaccination can be started as early as 12 weeks of age. Vaccinations of dams 2-6 weeks prior to foaling is also recommended. Booster vaccinations are required every 6-12 months. There are complications associated with vaccination which should be discussed with your veterinarian. When introducing a new animal onto a property they should be isolated for 2 weeks. Restricted movements of sick / affected animals. Monitoring rectal temperatures of animals in contact with affected animals. Restricted human access to sick / affected animals. Double fencing or windbreaks along boundary fences.